I skip meat at these places because I don’t know where it’s from. My own kitchen only serves up meat from humanely-raised animals (or wild-caught). It’s nice knowing that the pig behind my bacon had an opportunity to enjoy a nice pig life, or the cow behind my hamburger could graze in a pasture (like cows used to do). Transparency is missing in the grocery store. 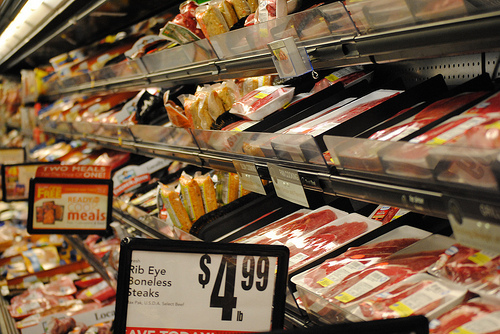 When we buy meat and food from the grocery store, we don’t know how it got there. Ignorance is bliss. We trade transparency for cheap, convenient food. Unless I know where the meat came from and what kind of environment the animals were raised, I simply choose not to take the chance. Personally, though, I think pasture-raised meat tastes way better. While it’s great that society does care about what food we eat, we also need to think about what our food eats. Treat our food well, and it will treat us well.